Tired from all the craziness of the holiday season? Want to have a more intimate New Year’s Eve with your closest friends? Have you considered a cozy little dinner party? Well, if you and friends are in the same mind set this year and would prefer a relaxing night, consider the dinner party option. We suggest having a fondue dinner for this intimate occasion. 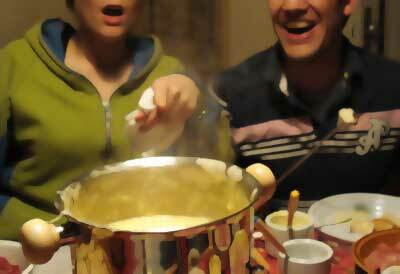 Guests gathering around a fondue pot creates an atmosphere where socializing is easy and natural. Great conversations, genuine laughter, and delicious foods are all outcomes of this communal dining experience. 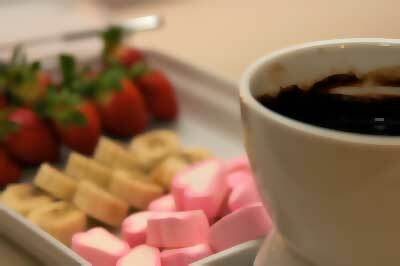 Chocolate fondue also offers a great dessert option. Strawberries and other fruits such as slice apples, oranges, and melons are the perfect dipping items. Decorate the room with lots of cozy candlelight. Add some red poinsettia plants as table accents since their color will add to the warm ambience. Just because the party is intimate, it doesn’t mean it has to be quiet and dull; so pick up some party goods like noisemakers and hats. Create a selection of music that is relaxing during dinner, and more up beat for dancing later in the night. Remember to keep the drinks flowing; wine is particularly good for this type of warm gathering. Don’t forget to have a bottle of Champagne chilling for the eventual count down. Sharing New Years with the people you feel closest to, in an atmosphere that is both cozy and warm, is guaranteed good time. Enjoy.